Etienne-Louis Boullee (1728-1799) was half a generation younger than Soufflot and far more daring. He began as a painter and retired early, but though he built little, his teaching at the Royal Academy helped to create a tradition of visionary architecture that flourished during the last third of the century and the early years of the next. Boullee's ideal was an architecture of "majestic nobility," an effect he sought to achieve by combining huge, simple masses. Most of his designs were for structures on a scale so enormous that they could hardly be built even today. He hailed the sphere as the perfect form, since no trick of perspective can alter its appearance (except, of course, its apparent size). 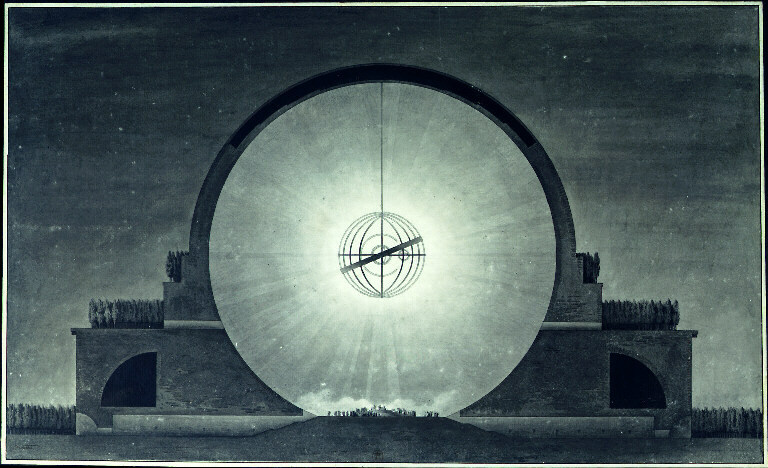 Thus he projected a memorial to Isaac Newton as a gigantic hollow sphere, mirroring the universe (fig. 872). "O Newton!" he exclaimed, "I conceived the idea of surrounding you with your discovery, and thus, somehow, of surrounding you with yourself." The interior was to be bare, apart from an empty sarcophagus symbolizing the mortal remains of the great man, but the surface of its upper half was pierced by countless small holes, points of light meant to give the illusion of stars. 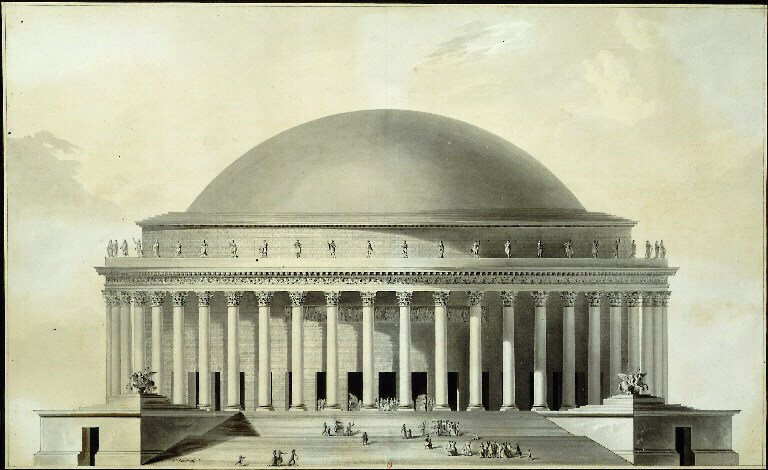 Bathed in deep shadow, Boullee's plan for the memorial to Newton has a striking pictorialism inspired in part by the Prison Caprices of Piranesi (see fig. 856). 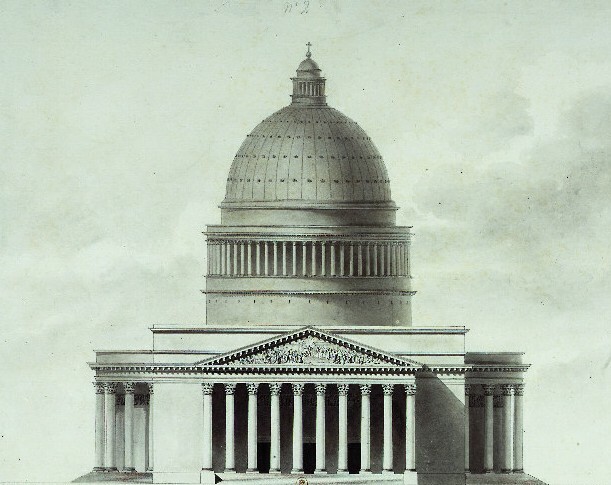 Plans such as this have a Utopian grandeur that dwarfs the boldest ambitions of earlier architects. Largely forgotten during most of the nineteenth century, Boullee was rediscovered in the early twentieth, when architects again dared to "think the unthinkable." 872. ETIENNF-LOUIS BOULLEE. Project for a Memorial to Isaac Newton. 1784. Étienne-Louis Boullée, (born Feb. 12, 1728, Paris, France�died Feb. 6, 1799, Paris), French visionary architect, theorist, and teacher. Boullée wanted originally to be a painter, but, following the wishes of his father, he turned to architecture. He studied with J.-F. Blondel and Germain Boffrand and with J.-L. Legeay and had opened his own studio by the age of 19. He designed several Parisian city mansions in the 1760s and �70s, notably the Hôtel de Brunoy (1774�79). Despite the innovative Neoclassicism of his executed works, Boullée achieved a truly lasting influence as a teacher and theorist. Through his atelier passed such masters as A.-T. Brongniart, J.-F.-T. Chalgrin, J.-N.-L. Durand, A.-F. Peyre, and L.-M. Thibault. In all, he taught for over 50 years. 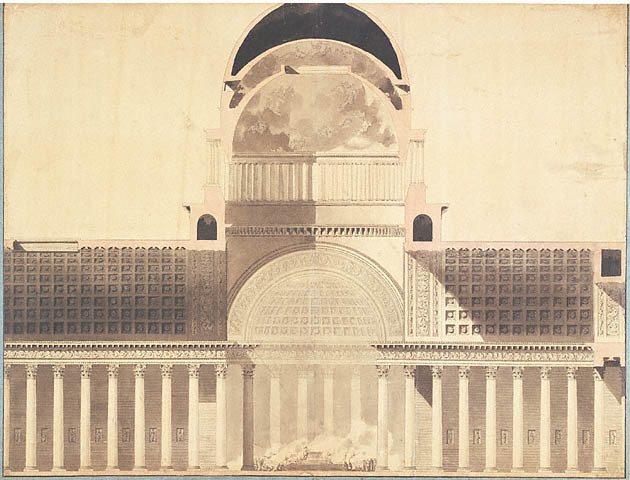 In his important theoretical designs for public monuments, Boullée sought to inspire lofty sentiments in the viewer by architectural forms suggesting the sublimity, immensity, and awesomeness of the natural world, as well as the divine intelligence underlying its creation. At the same time, he was strongly influenced by the indiscriminate enthusiasm for antiquity, and especially Egyptian monuments, felt by his contemporaries. The distinguishing aspect of Boullée�s mature work is his abstraction of the geometric forms suggested by ancient works into a new concept of monumental building that would possess the calm, ideal beauty of classical architecture while also having considerable expressive power. 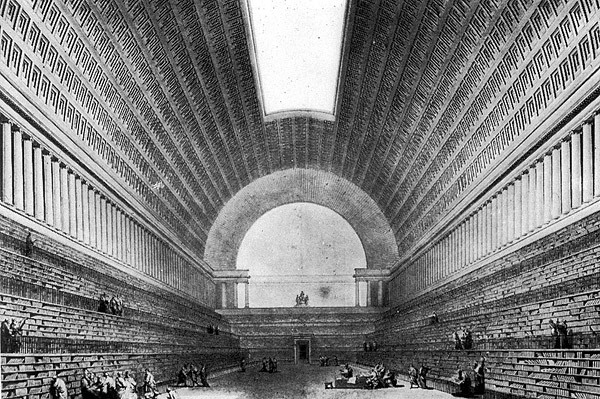 In his famous essay La Théorie des corps, Boullée investigated the properties of geometric forms and their effect on the senses, attributing �innate� symbolic qualities to the cube, pyramid, cylinder, and sphere, the last regarded as an ideal form. 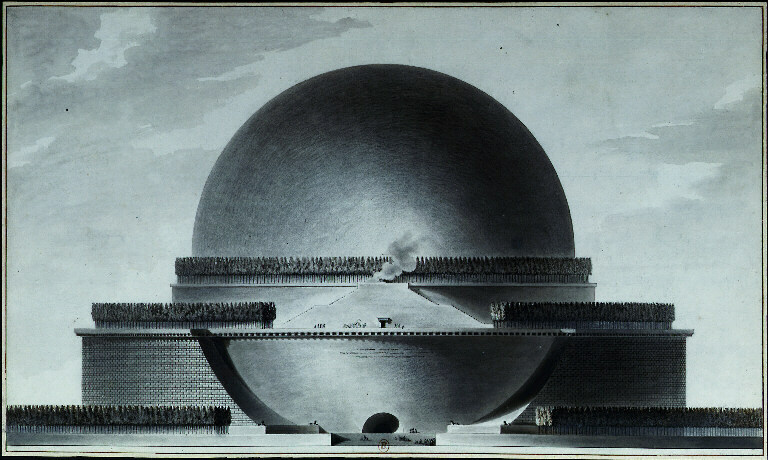 In a series of projects for public monuments, culminating in the design (1784) for an immense sphere that would serve as a cenotaph honouring the British physicist Isaac Newton, Boullée gave imaginary form to his theories. 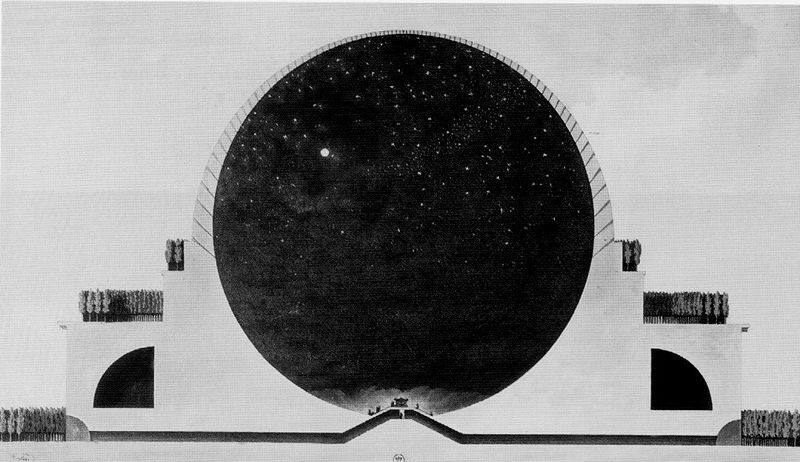 The interior of the cenotaph was to be a hollow globe representing the universe. To bring geometric forms to life, Boullée depended on striking and original effects of light and shadow. He also emphasized the potential for mystery in building, often burying part of a structure. 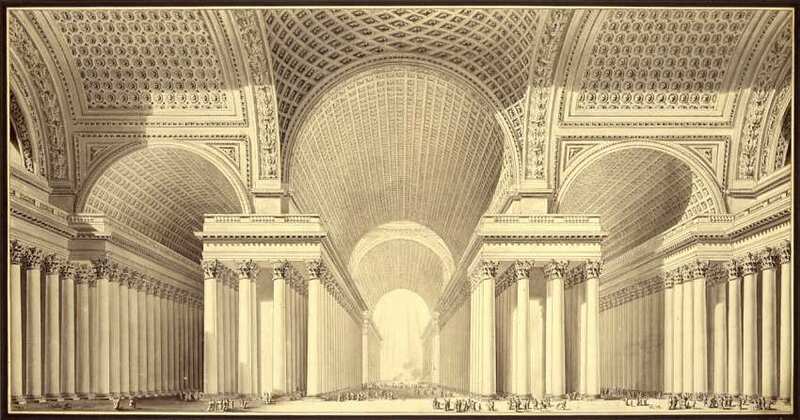 This �poetic� approach to architecture, in some ways prefiguring the 19th-century Romantic movement, may also be seen in Boullée�s extensive use of symbolism. For example, his Palais Municipal rests on four pedestal-like guardhouses, demonstrating that society is supported by law. Boullée�s emphasis on the psychology of the viewer is a principal theme of his Architecture, essai sur l�art, not published until the 20th century. He has been criticized as a megalomaniac, because of his tendency toward grandiose proposals, but these should be regarded simply as visionary schemes rather than as practical projects. In his desire to create a unique, original architecture appropriate to an ideal new social order, Boullée anticipated similar concerns in 20th-century architecture. Etienne-Louis Boullee. 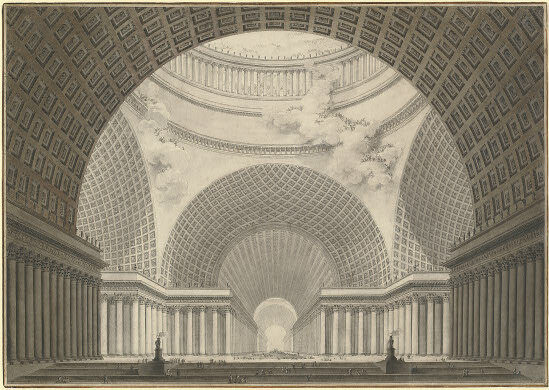 Projet de reconstruction de l'Opéra de Paris, 1781. 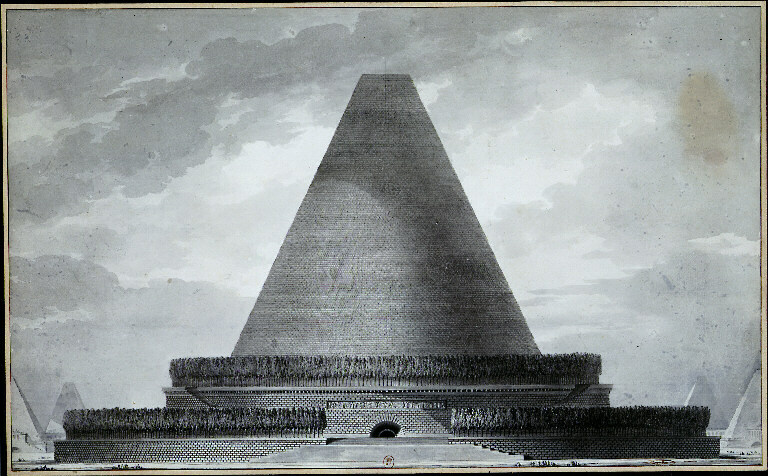 Architectural drawing of a Church for the cult of the supreme being, named "Métropole"